Sea fishery patrols and research are now carried on by the SA Navy. 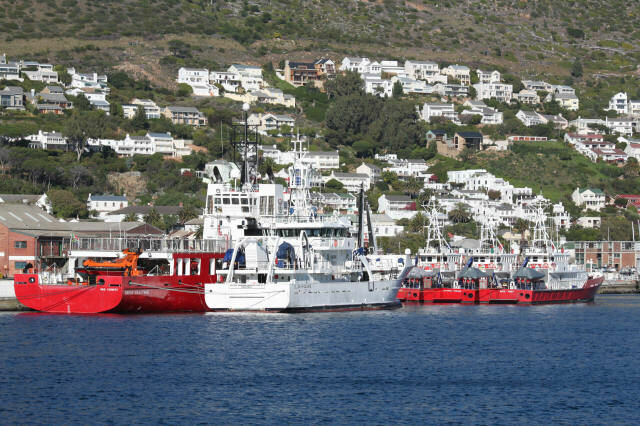 The Departments of Agriculture, Forestry and Fisheries (DAFF) failed to award a tender to civilian maritime companies to operate the department's patrol and research fleet. The SAS Algoa – together with the SAS Africana, the SAS Sarah Baartman, the SAS Ruth First, the SAS Lilian Ngoyi, the SAS Victoria Mxenge and the SAS Ellen Khuzwayo – had been originally transferred from the former environmental affairs and fisheries department. While Agriculture Minister Tina Joemat-Petersson was accusing it of “fronting”, black-empowered Smit Amandla lost the contract to run the ships at the end of March 2012. Smit Amandla, which ran all the ships for 17 years from 1995, said it was considering taking the matter to court to clear its name. The department has accused it of corruption involving between R1.6 billion to R2bn allegedly involving deals with fisheries officials. It remains baffling why the Fisheries Minister refused to communicate openly about the progress being made in getting patrol and research vessels fully operational once again. The task of ensuring that the vessels were safe to proceed to sea has become the first priority since the Joint Commissioning Ceremony took place on 19 June 2012, when the DAFF vessels were brought under the command of Naval Commanding Officers. 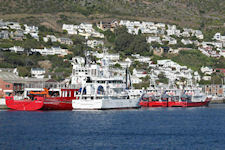 Five more patrol and research vessels from the Department of Agriculture, Forestry and Fisheries (DAFF) found their home base in Simon’s Town harbor at the first joint commissioning ceremony held in Simon’s Town on 19 June 2012. The DAFF research and fishery vessel SAS Africana (formerly Africana) was commissioned exactly two months earlier with Capt Khwaedi Lotta Mabula as the Officer Commanding. An inter-ministerial Memorandum of Understanding (MOU) signed between the Minister of Agriculture, Forestry and Fisheries and the Minister of Defence and Military Veterans on 30 March 2012 entailed the SA Navy performing the shipping management functions of the DAFF vessels (previously administrated by SMIT Amandla Marine). The management of these functions includes crewing/manning, technical management (maintenance and repair), provisioning, bunkering, operation and the accounting of all aspects relating to these functions. Refitted in 2001, SAS Africana was owned by Marine and Coastal Management (Department of Environmental Affairs). Length 77.85m, 2452 tonne, max speed 14.5 knots, cruise speed 12 knots; range 20000 nautical miles; endurance 45 days; complement 52 (19 scientists); Built by Dorbyl Marine, Durban. Eight laboratories and three containerised labs. Research and monitoring to guide management of South Africa’s offshore fisheries. SAS Ellen Khuzwayo is a research vessel of the Marine and Coastal Management, Department of Environmental Affairs; replaced Sardinops (operated from 1959 to 2008); 43.2m; range 2500 nm; endurance 20 days; cruise speed 13 knots; 21 scientists. Built: Farocean Marine (Pty), Cape Town. Six winches (incl. CTD, towing, vertical, long line); A-frame; Seabird CTD, ADCP, echo sounders; extensive navigation and comms. Main research: fish, rock lobster; marine mammals Fisheries inspectors from DAFF have been seconded to the SA Navy vessels for these patrols. During May and June 2012, three patrols were conducted totalling approximately 304 hours at sea. One of the patrols resulted in the arrest of a fishing vessel that was not in possession of the required permits and a fine was issued.